According to new figures from Microsoft,more than 30,000 developers are building bots on the company’s Skype Bot platform—no too shabby, given that Microsoft first announced the platform at its Build developer conference in March. Microsoft also recently announced that it is boosting bot development a bit by adding a few more features to the platform, including the ability for bots to participate in group conversations. While we can’t think of the last time we, along with our friends, chatted with a bot en masse, Microsoft’s tweak will now give those looking to make game-themed bots a bit more flexibility (at least). Though a giant group version of hangman doesn’t sound all that interesting, we wonder if someone would be able to craft up some kind of Mafia-themed bot or, at the very least, a pretty compelling trivia bot. Microsoft is also now allowing bots to interact with users via cards, images, and other graphics. In other words, the conversations don’t have to be simple, boring, and full of text. 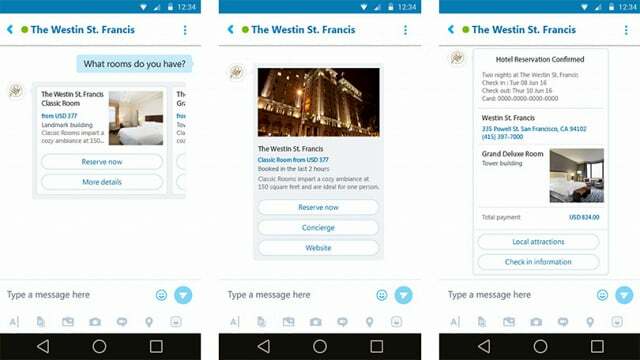 Bots will now be able to respond with images of a hotel room one might be looking to book or a picture of a retail location a person is trying to find more information about, for example. And someone out there is surely creating some kind of “cute animal bot” that just responds with pictures of your favorite animal—assuming you tell the bot what that is. Bots will also be able to send you visual receipts for items you’ve purchased. Skype bots will can also help users check into third-party services within conversations. To borrow an example from Microsoft, users will be able to check into their guest account with supported hotel chains while they’re simultaneously using the bot to help them book a room. This keeps the overall experience under one roof, as a user won’t have to jump out to an external site to log in—and that’s precisely the point of having a bot conversation instead of, you know, just going to a hotel’s website and booking a room. “Microsoft has brought together the Skype Bot developer tools and the Microsoft Bot Framework into one environment which we’re calling the Microsoft Bot Framework “V3″. You can now develop bots which use new Skype platform features – such as visual cards and group bots – and publish to multiple channels from one place,” reads Microsoft’s description.